Intellectual Ventures, an initiative by Bill Gates, is developing a nuclear reactor which works on the waste of other reactors. After this traveling wave reactor is loaded with nuclear waste it can be hermetically closed and produce energy for over half a century. The uranium waste which is stored worldwide is enough to provide energy to a world population of ten billion for ten thousand years. 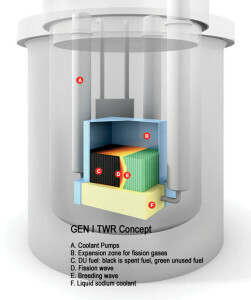 Conventional reactors only use 1% of the available energy in fission fuel. This means the world reserves of natural uranium are being depleted at a rate comparable to fossil fuels. The nuclear waste consist almost completely of uranium-238, also known as depleted uranium, the isotope which cannot be used for fission. 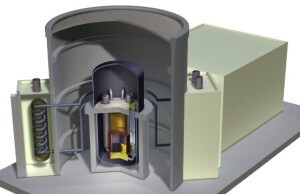 The traveling wave reactor converts this uranium-238 to plutonium-239, which is suitable for fission. The waste from these reactors is comparable to the waste mix from conventional reactors, expect for the fact that there is no uranium-238 as waste. This does mean that there is still need for proper storage of the waste. Possibly the reactor itself will function as a burial for the waste. Research now is aimed at materials which could withstand the heat produced in fission. It is expected that if all technological problems are solved that the first traveling wave reactors could be operative around 2040 when the successors of current fission reactors are also to be expected.